First annual Roy Campbell Commissioning Grant Awardee! Cornelia Street Cafe: 29 Cornelia St, New York, NY 10014 (212) 989-9319. Igmar Thomas quartet with Corcoran Holt -bass, Zaccai Curtis -piano, Dana Hawkins – drums. – “I heard the future here and now — let’s call it the present! — in the form of trumpeter Igmar Thomas.” – ArtsJournal.com. Igmar Thomas is one of New York’s most celebrated musicians, bandleaders, composers and arrangers. 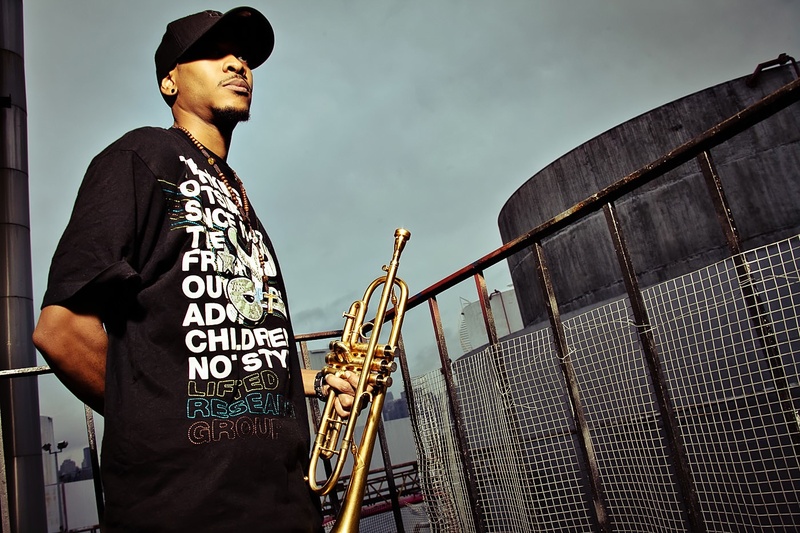 He attended Berklee College of Music in Boston, which led to the formation of his group, Igmar Thomas & The Cypher, as well as musical connections to peers and legends alike, such as Esperanza Spalding, Terri Lyne Carrington, Lionel Hampton, Wyclef Jean, Talib Kweli, and countless others. In addition to his work with The Cypher, Thomas is the conductor of the Revive Big Band, which Complex Magazine refers to as “a 19-piece jazz army.” The Cypher plays hip-hop-inflected music with a strong jazz foundation and has featured a range of artists including Talib Kweli, Nicholas Payton, Roy Hargrove, and DJ Premier. From naming his band “The Cypher”, to orchestrating classic hip-hop songs & samples for live instrumentation, to performing with emcees, whom he calls the “mainstream hornmen of today,” it’s clear that hip-hop, for him, is not separate from jazz, but the vibrant result of the natural evolution of improvised Black American music. It is no surprise, then, Thomas’ gift has taken him to hallowed musical venues like Carnegie Hall, Harlem Stage, the Apollo Theater, and The House of Blues. He has appeared in musical performances at major events like the NBA All Star Game Weekend and George Wein’s Care Fusion Jazz Festival. He has also appeared on television programs including The Tonight Show with Jay Leno with the Tedeschi Trucks Band, a Comedy Central show with Zach Galifianakis, and countless music videos that have aired on MTV, BET and more. Thomas has appeared as a featured guest with performers including J. Cole, Marc Cary, The Roy Hargrove & The Mingus Big Bands’, and a host of other celebrated artists and groups. He has worked and/or recorded with Wyclef Jean, John Legend, Ravi Coltrane, James Moody, Clark Terry, Jim Jones, The Roots, Pete Rock, Macy Gray and many more. Thomas has shared the stage and spent studio time with the likes of Patti Labelle, Mos Def, Terence Howard, and Iggy Pop. He has also performed as an opening act to various artists such as Chick Corea, Snoop Doggy Dogg, Destiny’s Child and The Wu-Tang Clan, just to name a few. He just finished touring with Esperanza Spalding as part of her Radio Music Society tour.